Last week a new blog carnival was announced on the Nature Blog Network. Though there are carnivals dedicated to everything from birds to trees to deserts, reptiles and amphibians (collectively herpetiles, shortened to herps) had been overlooked. This new carnival, called House of Herps, was organized and brought to fruition through the efforts of Amber of Birder’s Lounge and Jason of Xenogere. The first carnival will be hosted at the official House of Herps homepage, but subsequent editions will be roaming, hosted at a different blog each month. The deadline for submissions for the first issue is December 15 (which is tomorrow as of when I’m typing this). It hasn’t been warm enough for herps to be active about here since early November, so I have no recent herp encounters that I might share. Instead, I thumbed through my photo archives to see what I might be able to find. I recalled a few snakes in the summer that I took photos of but never got around to posting (there’s always lots of those). As I was looking for them, though, I stumbled across these photos, taken September 17, back when the trees were still mostly covered in green leaves, and snow was but some vague idea in the future. They’re photos of a shed snakeskin. 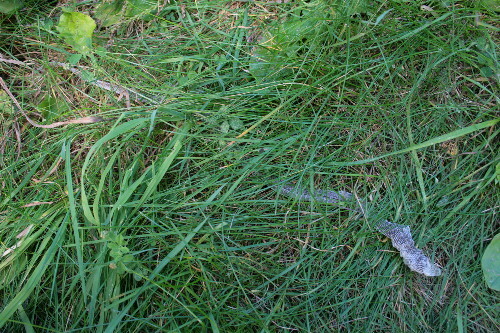 I found this skin threaded through the long grasses beside our front steps. You can actually tell the species of snake that shed the skin from the pattern of its scales, if the skin is sufficiently intact, but we have few enough snake species up here that just its size told me it was from a Garter Snake. Don’t ask me how you’d check the scales; I don’t find too many shed skins, so I’ve never bothered looking up how to identify the species. Snakes are somewhat unusual in the vertebrate world in that periodically they’ll shed their entire skin. How often they do so depends on a few factors, including age of the snake, the snake’s metabolism, the particular species of snake. Young snakes, in their first year or two of life, may moult as often as once a month, or perhaps as few times as every three months. Older snakes might moult once or twice a year. 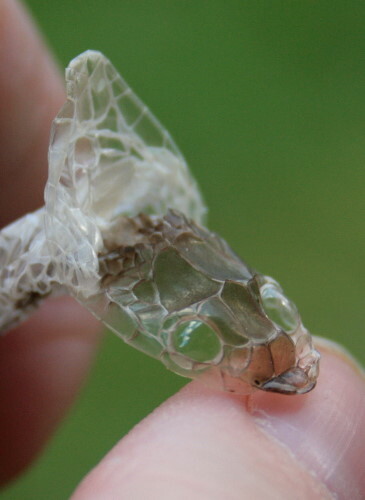 Whether the moulting allows for the snake to continue growing, in the way that an insect shedding its exoskeleton allows it to grow, is still disputed. At the very least, though, the moult allows the snake to replace damaged scales, and also to shed itself of ectoparasites such as mites. Mammals and birds are constantly shedding damaged or dead skin cells (eg. dandruff), but reptiles must periodically moult their skin to refresh it. This regular “renewal” is thought to be the reason the snake appears on the well-known symbol of medicine (the Rod of Asclepius). I like how in the above photo you can still see the grooves of the keel along each dorsal (back) scale. This is the head end, but the skin from the head is actually tucked inside the tube. A snake’s scales are made of a hard substance secreted from the epidermis: keratin, the same stuff that forms our fingernails. Just as our fingernails are firmly attached to the skin underneath, so too are the snake’s scales. 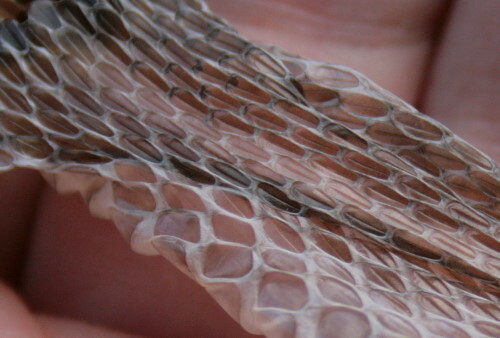 When it comes time to moult, the snake forms a layer of specialized cells in between the scales and the epidermis. At the same time, it begins forming a new layer of scales underneath the old ones and the new specialized cells. Once the new scales are ready to show off to the world, the specialized cells between the two layers of scales liquifies, essentially freeing the old skin from its bonds. The snake will rub its chin and nose against a rock or something else hard and abrasive to break the edge of the old scale layer. It then either finds a tight spot or something rough to rub up against, and uses that to grip the old skin as it wriggles out. 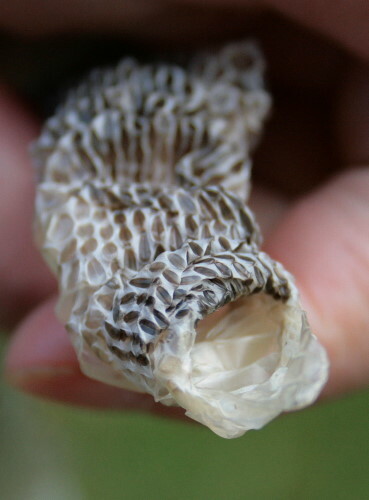 Often the old skin will just peel back off the snake like rolling a tube sock off your foot, with the result that the shed skin is actually inside-out. Check out the second image again. The keels of the scales actually face into the tube, not out from. Keratin, when formed thinly enough and softened with moisture, is actually fairly pliable and transparent. Think of your fingernails (if you ever let them grow long enough :) after a shower or washing the dishes. While the skin and scales are attached to the snake’s body they are kept hydrated, so they offer a softer protection than, say, the armour of a pangolin. They’re easily punctured by teeth or talon, and mostly serve as protection to the snake from pokey things in its environment such as twigs or rocks. See how each belly scale has a bit of a backward-facing lip on it? Those help provide grip to the snake as it’s sliding across the ground, since the rest of the scale is very smooth and designed to reduce friction. As the outer skin is separated from the new inner skin, it will begin to dry out and lose its lustre, even before it’s actually shed, giving the snake a slightly unhealthy look. Just prior to a snake starting its moult, its eyes go cloudy blue-white, and its vision is very limited. During this period it will often stop eating and find itself a safe place to hole up until it can see again. Although the websites I checked didn’t specifically say so, I think the cloudiness is caused by the liquification of that middle layer of cells; once the outer skin has been severed and the liquified cells either reabsorbed or whatever it is that happens to them, the eyes will clear up again. The whole process takes about two weeks. Now imagine doing that twice a year. Aren’t you glad you’ve got dandruff instead? Okay, dandruff wins for convenience, but it will never be the thing of beauty that is a snake’s shed skin. Thanks for explaining how the eye scales protect the unblinking creature. It’s definitely neat to find one, Lavenderbay, and marvel over it. Hard to do that with a few flakes of dandruff. LOL! Somehow it’s hard to decide if dandruff is the better end of this trade. Very informative, Seabrooke. Though I knew the basics of shedding in snakes, I didn’t realize we still had no definitive explanation for why they do it the way they do it. It’s also intriguing to read how the process works. And I had no idea you could ID the snake by the shed skin. Though I’ve seen some that were obvious by size or other indicators (e.g., the tail of a rattlesnake), I figured mostly they could only be identified in special cases. Very interesting to know there’s a name hidden in each shed skin (even if I have no idea how that works!). By the way, thank you so much for supporting the new carnival! I really appreciate the mention. Happy to do so, Jason! I hope you got a good response. Liquifying cells? Who knew! And how did someone discover this? As I keep saying, Nature never ceases to amaze. It’s pretty intriguing, eh, Ellen? I bet a lot of dissections took place early on to figure it all out, though. It’s still the only way to find a lot of things out, unfortunately. Thanks for stopping by! I found your explanation of how snakes move equally fascinating. One tends to think of them simply slithering side-to-side. I always love finding snake skins but have never thought to photograph them before. Your pictures really capture their beauty. Thanks, Elizabeth. Great photo of a rattler, I can’t imagine having to worry about encountering one in the yard! Glad you practice catch-and-release. Nicely done, Seabrooke. A most informative post. I had the opportunity to watch this process many times at the museum where I worked, and it never ceases to fascinate. (Visitors as well as me.) Over the course of several sheds, reptiles repair even severe damage (like surgical scars). Wish we could do that! 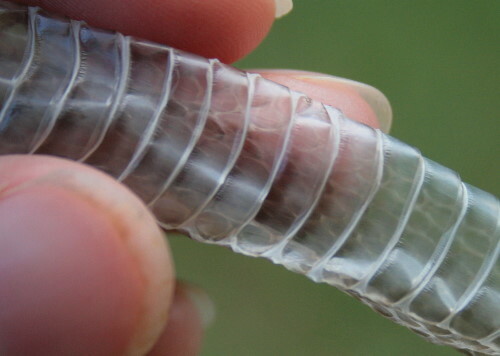 By the way, an entire skin like this indicates a healthy (or at least well hydrated) snake. Under too-dry conditions, a snake sheds in pieces (more like large dandruff! ), as lizards usually do. Thanks for sharing this info, Sally. That’s pretty amazing that even scars can eventually be shed. I also hadn’t really thought about how hydration would affect the process, but I’m not surprised. Glad to know our snakes are doing well!